My husband and I have been married for four years. We have three kids, so date nights are a big deal when we have one. However, our typical date night can be, well, typical. We’ll go to dinner and a movie or dinner at the movies, maybe drive up to the casino in Oklahoma. They’re fun, and I love spending time with him, but I’ve been wanting to do something to really “WOW” him! For our Valentine’s Day date night, I wanted to spice it up a little. I decided I was going to create a Romantic Treasure Hunt just for him! Nate loves puzzles and clues and things like that, so I know he’s going to love it. UPDATE – See the actual date night here! It came out so much better than I ever thought! When I sat down to write the clues, I felt a little intimidated. Making clues and rhyming them was rather scary. I searched for inspiration online, and there were quite a few ideas. Finally, I got into a groove and was able to plan it out, write all the clues all within an afternoon. 1. First, I planned out what I wanted the end result to be, which was three things. To meet me at the place we had our first date (and later, his proposal). To go to a restaurant where we had one of our most fun dates. Lastly, to go back home to some champagne, the last clue in a Valentine’s card, KY Yours+Mine, and a bed covered in a heart of rose petals. 2. Next, I decided the BIG CLUE was the clue to meet me at the bookstore where we had our first date. I wrote that clue out big, cut it into 6 puzzle pieces, and then created 6 clues each with a piece of the puzzle. 3. 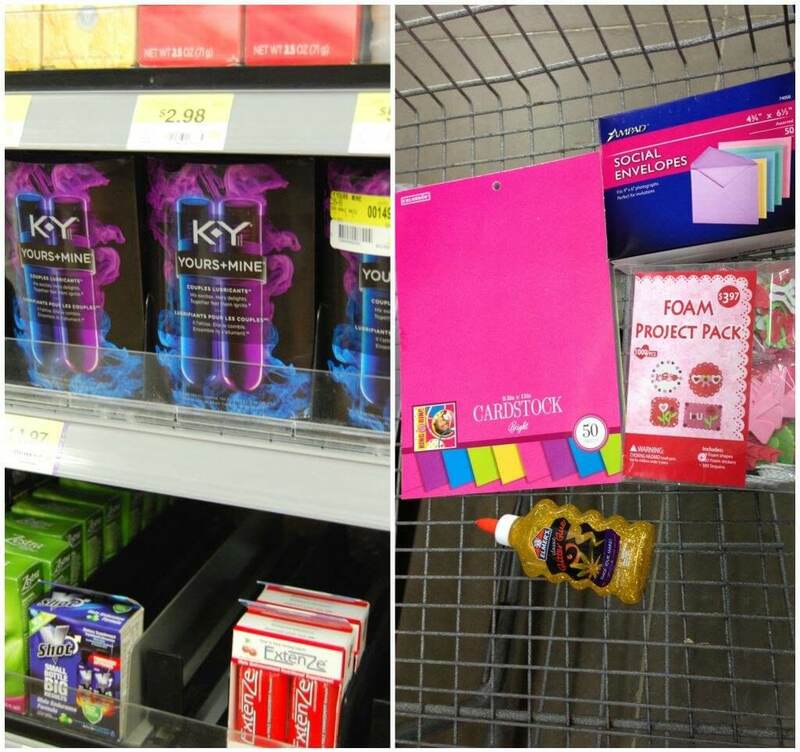 At Walmart, I purchased cardstock, colored envelopes, KY Yours + Mine, and then, I went to the Valentine’s Day section and purchased a DIY Valentine kit. 4. When I originally wrote out my clues, I made sure to note (for myself) the location to hide the clue. This way I wouldn’t get mixed up. 5. Next, I typed up my clues and printed them on colored card stock. Some of them are personal to my husband, such as Hedwig is the name of his car. (It’s white, and he’s a huge Harry Potter fan). 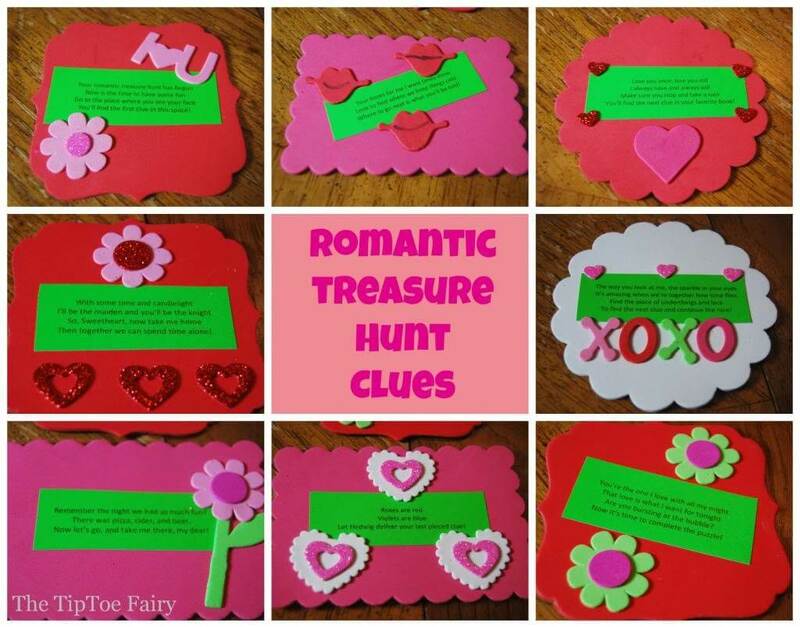 But, feel free to use any of these clues for your own romantic treasure hunt. Download a PDF of the clues here. 6. 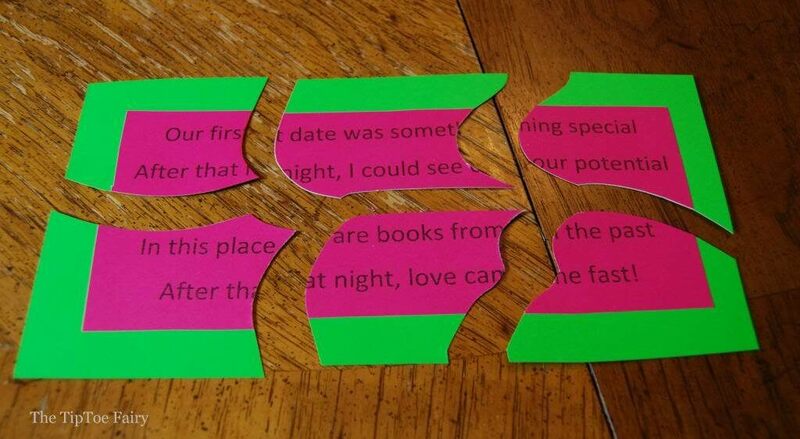 Then, I cut up the smaller clues and went to town with my Valentine’s Kit. I also put the clue # on the back of each Valentine, just in case something might get mixed up. 7. I sealed them all in the envelopes, labeled each envelope with its clue number, and then will hide them in their spots. 8. For Clue #7, I will be waiting for him at the bookstore and will hide it in plain sight right by the stacks where he asked me to marry him. He loves subtlety like that. For clue #8, I will give it to him at the restaurant. And then, clue #9, will be on the nightstand with our other goodies. 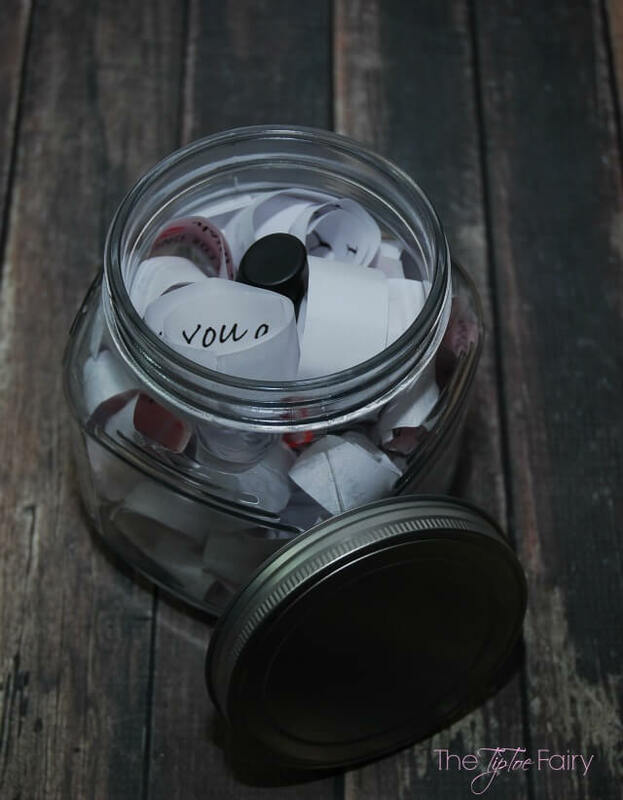 Have you ever made a Romantic Treasure Hunt? 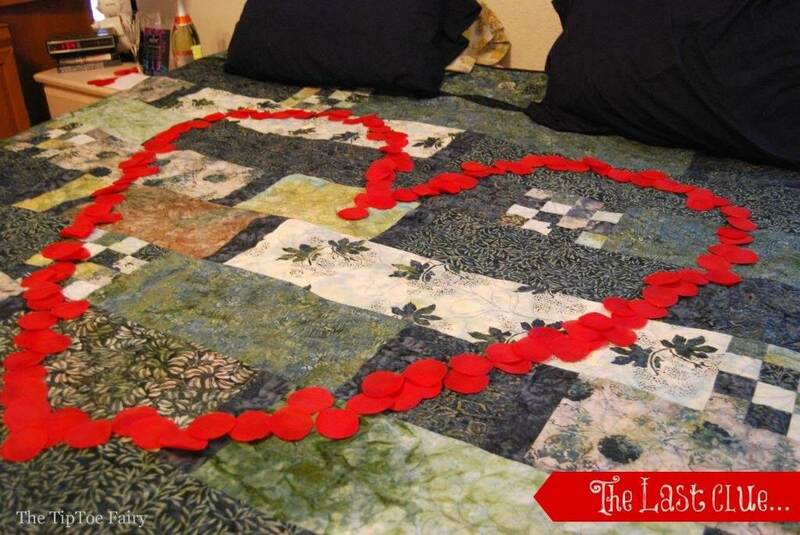 Looking for more romantic ideas? Check these out! This is such a cute idea!!! My husband doesn’t do surprises but he would love a hunt!! Thanks! I can’t wait to do this with him! He knows something’s up but he has no idea what it is. I’m planning to do a follow up with pictures. I hope he enjoys it as much as I did putting it together. He will love this! All that detective work will ramp up the anticipation. 🙂 Great fun! 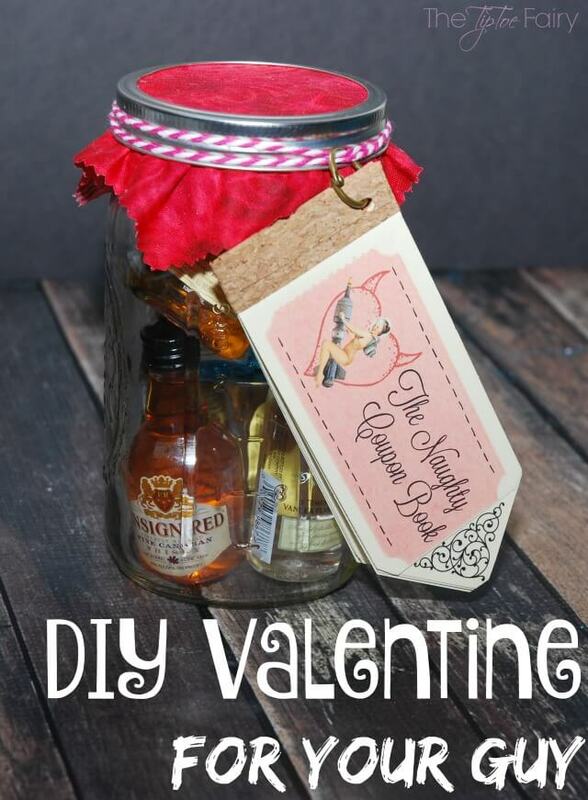 What a sweet valentine idea! Makes me wish I did have a significant other! Sounds like it would be a great night and lots of fun. Wow! That is so fun. These are the things that make memories! Looks like so much fun! I’m gonna have to keep this in mind for a date night with hubby! This is so much fun! You’re so creative! My husband would love this. He could care less about gifts but loves a romantic gesture! This sounds absolutely perfect!!! I am going to try something like this. Our birthday is two weeks apart so probably the weekend between our birthdays! This just made my life so much easier! Thank you Stephanie!!!!!! This is so sweet and cute ! I plan on doing this for my hubby but the last clue is when he is going to find out he’s going to be a daddy !